Steve Lipin is chairman and chief executive of Gladstone Place Partners, a New York-based strategic communications firm. He is a trusted advisor in the field of strategic, financial and corporate governance communications. Steve has spent more than 30 years at the intersection of the corporate world, Wall Street and the media as a leading financial journalist at The Wall Street Journal and top communications strategist to C-Suites, boards of directors and chief communications officers. Steve started Gladstone Place Partners in October 2017 after 16 years at Brunswick Group, where he was U.S. Senior Partner. At Gladstone Place, clients include Accenture, Arconic, the Walt Disney Co., Pfizer and others. Steve has worked on many M&A assignments in size and scope, most recently Andeavor on its announced strategic combination with Marathon Petroleum, Disney’s planned acquisition of 21st Century Fox, InBev’s acquisition of Anheuser-Busch, Grupo Modelo and SAB Miller; Pfizer’s acquisition of Wyeth, the combination of Kraft and Heinz, Air Liquide’s purchase of Airgas, and Marriott’s acquisition of Starwood. He has also advised many companies on shareholder activist defense, including Travelport, Heinz, PepsiCo, eBay, Yahoo!, Macy’s, AIG, Freeport McMoran and Arconic, among others. He has worked on many crisis situations, executive leadership changes and cyber breaches. 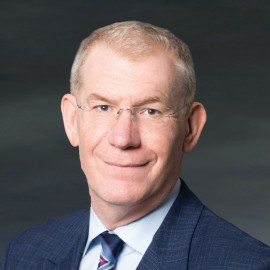 Steve joined Brunswick in 2001 from The Wall Street Journal, where he was the Finance Editor, supervising the paper’s coverage of mergers, commercial banking, private equity and corporate finance. From 1995 to 2000, Steve covered mergers and acquisitions for the Journal, redefining the M&A beat, being nominated for a Pulitzer Prize and launching the Deals and Dealmakers column during his tenure. He joined the Journal in 1991 to cover banking after cutting his teeth at financial publications such as Institutional Investor and American Banker. Born in New York City, Steve graduated from Boston College with a bachelor’s degree in economics. He is a board member of Student Sponsor Partners, a member of the Board of Advisors of the Knight-Bagehot Fellowship In Economics and Business Journalism at Columbia Journalism School, a member of the Board of Overseers of the Columbia Journalism Review, and a board member of Youth-Inc. He is married with three children and lives in New York City.